Here are my top ten technologies of 2009. Last year I posted my top ten technologies of 2008, this year I am doing it again. The technologies that were in last year’s list which didn’t make the grade this year were: The PSP, which though is still a fantastic technology, the original format offered nothing new, the new upgraded version did not cut the mustard as far as I was concerned. Also without the long promised keyboard it is still in the main a content consumption device and therefore dropped out of the top ten. The Asus EeePC which dramtically changed the market for computers is now as a format effectively dead. As I write companies such as Samsung and Lenovo are releasing cheap laptops that they are branding as netbooks, however these are for all intents and purposes just cheap laptops with 10.1′ screens and big keyboards. The small linux based micro-laptop format is no longer wanted by consumers and I didn’t really use mine in 2009, so it also dropped out of the top ten. iMovie ’08 was in my top ten in 2008, iMovie ’09 isn’t in my top ten of 2009. It’s not that I didn’t use it, I did, but like the PSP it didn’t offer anything new. Will be interesting to see what iMovie ’10 has to offer. The Edirol RH-09 was in my top ten last year, I still use it, but newer technologies have replaced it in the top ten. Likewise the iPod touch which was fantastic in 2009 has been replaced this year for me by my iPhone. Similarly the 3G USB Stick/Dongle has been replaced by newer technologies such as the MiFi, built in 3G and JoikuSpot. Anyway onto the top ten technologies of 2009. Released at the end of March, the Nintendo DSi took the best selling Nintendo DS and added extra functionality. From an e-learning perspective the addition of not one but two cameras made the DSi a tool that learners and practitioners could use to capture evidence; or to review a vocational activity. As the DSi can use standard SD cards, this means it is very simple to move files to and from the DSi to the network, VLE or the internet. It’s not perfect, it’s not that easy to put content on the DSi, the lack of a browser coming as standard and the fact that it is a gaming device first and foremost. However it is in my top ten as it had a real impact in Gloucestershire College on teaching and learning. Though there are cheaper video cameras out there, and there are cameras which have better lenses, the Sanyo CA9 is in my top ten technologies due to the fact that a) it uses SD Cards and b) it is waterproof. Cameras with built in Flash memory are great (as you don’t need an SD Card) however SD Cards allow learners to use the camera and the pass it to another learner, whilst holding onto their content (video and images). The fact that the CA9 is waterproof means as well as taking it out in the rain (or swimming) if it gets dirty in a workshop, salon, kitchen, it can be rinsed under a tap. However the waterproofness gives one main disadvantage in that you have to remove the battery to charge it, making it awkward to charge a class set. Despite that one reservation, the Sanyo CA9 is in my top ten of 2009. Video cameras in general can have a real impact on teaching and learning, and we found by putting over a hundred and fifty of them into the college has had a real positive impact and improved retention and achievement. Last year in my top ten for 2008 I had in two cameras, the Sony HDR-SR8 and the Panasonic HDC-SD5. This year I have as a result of using the Sony HDR-SR8 camera, bought some more cameras for use by staff and in the main used the new Sony HDR-SR10E HDD Camcorder . This is at the high end of the consumer market, though you do get a lot of features. Key ones for me are, a decent lens, full 1080i resolution, a 250GB on board hard drive, and I also had a selection of microphones as well. I used it a lot for taking video this year and very pleased with the end results. Easy to import the video into iMovie ‘09, edit and export. So you need to shoot video? You need to stream video? You need to record video? You need more then one camera? You want graphics, you want presentation slides, you want to screenshare? Though there are a plethora of tools out there for shooting and recording video, screen captures, presentations; most then require you to edit the footage before sharing. One of the things I wanted to do in 2009 was to do all that, but do it live! You can do that using a TV Studio, but it’s not very portable; the Tricaster is! The process of creating live, network-style television can be very costly and require massive amounts of expensive equipment and a large crew of people. TriCaster™ changes all of that. In one lightweight, portable system (small enough to fit in a backpack), you have all of the tools, including live virtual sets on select models, required to produce, live stream, broadcast, and project your show. A simple idea which just works. Basically it turns my Nokia N95 into a wireless hotspot, allowing me to connect multiple wireless devices to my phone’s 3G internet connection. I start JoikuSpot and once started I can then join the wireless and surf the internet. Usually I am using my iPod touch or my MacBook Pro. The Light version only really does internet, it doesn’t allow e-mail or https for example, whereas the Premium version does; this is the reason I upgraded to the Premium version and very pleased I am with it. The main downside is the impact it has on the battery life on the Nokia N95, down to less than four hours, often less! Having shot the video, encoding for the iPod or the web can seen to take an age. I have been using and impressed with the Elgato Turbo.264 HD which is a hardware encoder for encoding MP4 files (with the H.264 Codec). It speeds up the process dramtically, encoding is now faster than real time, often twice as fast; and doesn’t tie up the processor allowing you to continue to do other things on your computer. Elgato make some fantastic hardware, the EyeTV is a great device, the Turbo.264 HD allows you to take those recordings and other movie files and convert them easily and fast. The N95 was my top technology from 2008, it is still here in the top ten for 2009 as it is a device which I still use on a regular basis. The Nokia N95 for me is much more than a phone, it is a device which allows me to create upload and connect. Like the iPod touch I use it on a daily basis, though to be honest rarely as a phone or for SMS. The 5MP camera has an excellent lens and can be used to take some nice photographs. I use Shozu to automatically upload my photographs to Flickr or Facebook over the phone’s 3G connection or if in the right place over wifi. The phone also takes some nice video as well and I can use Shozu to upload that as well automatically. The Nokia N95 does come with a web browser, which is usable, but nowhere near as nice as Safari on the iPod touch. However all is not lost, using JokiuSpot (see above) I can turn the N95 into a wifi hotspot and use the N95’s 3G connection and the iPod touch for browsing, job done. Video works well on the N95 and simple MP4 files work well, though the screen is small, the phone comes with a composite video cable which allows you to show what is on the phone on a video screen or through a projector. I also use the phone to read QR codes which it does quite well. The N95 also has built in GPS and though routing software is extra, for checking where you are using Nokia Maps the phone works great. I also like how Shozu geo-tags the photographs I upload to Flickr too. It’s not all perfect, the device is very chunky and very thick, if you like thin phones, then you won’t like the N95. I am not a great fan of the keypad, but it’s better than some I have used, and to be honest I don’t like phone keypads anyhow! Though I have had this computer for just over a month, it is a fantastic piece of kit and as a result is not only in my top ten for 2009, but also my number two technology. This is one mean fast computer. For the first time I can be recording video, encoding video, using the web, CS4 and other stuff without it impacting on my workflow. It replaced a three year old Intel iMac which was (and still is) fantastically fast, but was starting to feel its age when handling multiple processor intensive tasks. With four cores and 8GB of RAM, this new iMac is the business and has made my life a lot less frustrating. 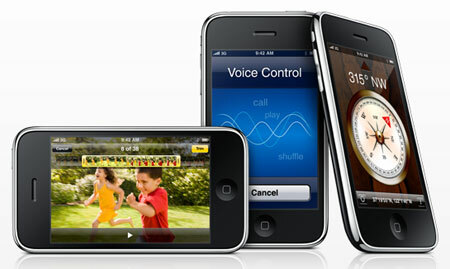 Last year my top technology was a phone, the Nokia N95, this year it is also a phone, the iPhone 3GS. Though the iPhone came to the UK in 2007, I did not buy one, as when it came out it did not meet my needs, no tethering, no 3G, no applications. Even the 3G model has some limitations, in the main the poor quality camera, at the time no videe and lack of tethering. The iPod touch did make my top ten last year as that was certainly the device to use if you wanted to use applications. With its Wifi connection and JoikuSpot and the MiFi I didn’t need the 3G connection that the iPhone provided. However… in March of this year I got an iPhone 3G through work, partly to support my MoLeNET work and partly as everyone was recommending the iPhone to me (and my work Nokia N73 was getting a little long in the tooth). I have to admit that the iPhone 3G was a great device and changed the way I communicated, collaborated and used the web. I started to use SMS as I did like the iPhone keyboard though I know others don’t like it. With the release of the iPhone 3GS and my home phone contract ended, I decided to switch to O2 and get the iPhone 3GS. I got the 32GB model (you can never have enough storage) and was blown away. This was almost the perfect device. With a great camera that shot good (enough) images and video, a great internet experience, the best on any mobile device I have used. However the biggest impact was the applications, the iPhone was starting to become the computer I travel with, communicate with, collaborate with, share with; and that is the main reason why I have put the iPhone 3GS as my top technology of 2009. You are currently browsing the archives for the hdr-sr10e category.